Inequality has become an essential tool in many areas of mathematical research, for example in probability and statistics where it is frequently used in the proofs. 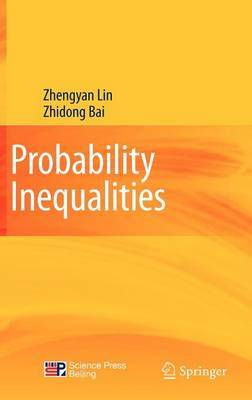 "Probability Inequalities" covers inequalities related with events, distribution functions, characteristic functions, moments and random variables (elements) and their sum. The book shall serve as a useful tool and reference for scientists in the areas of probability and statistics, and applied mathematics. Prof. Zhengyan Lin is a fellow of the Institute of Mathematical Statistics and currently a professor at Zhejiang University, Hangzhou, China. He is the prize winner of National Natural Science Award of China in 1997. Prof. Zhidong Bai is a fellow of TWAS and the Institute of Mathematical Statistics; he is a professor at the National University of Singapore and Northeast Normal University, Changchun, China.